One of the awesome things about my production company/ theater group is that we do a little bit of everything. 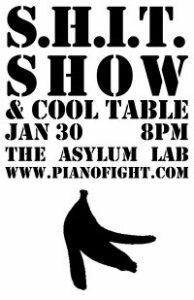 Tomorrow, we will be showing off our sketch comedy skills with a special one night show at Asylum Lab in Theatre Asylum. The S.H.I.T. Show grew from a few UC Berkeley theater students to a full-on sold-out touring hilarious comedy troupe. Happy Valentines DayIn "los angeles"
2 Cities, 1 Show: ShortLived 3.0In "inspiration"
ShortLived 3.0 Submissions, for WritersIn "opportunities"